The directives are pretty self-explanatory. 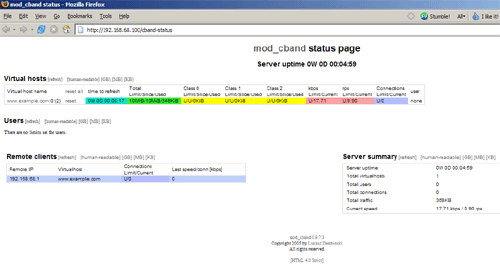 The CBandPeriod directive specifies after what time the traffic counter is reset to 0. Please note: the CBandExceededSpeed and the CBandExceededURL directives are mutually exclusive. They do not make sense in the same vhost! Of course, you are free to combine the directives of chapter 3.1 and 3.2 in any way you like. you should touch the file not do mkdir.